Al Norman is a successful consultant with Paradigm Consulting Group Inc. 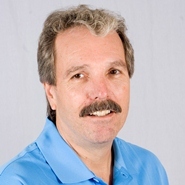 He focuses on manufacturing, and specializes in applying lean methodologies to manufacturing. He has also worked as an engineering manager, and a plant manager, and is a long-term mentor both with Futurpreneur Canada and with the Regina Chamber of Commerce. Experience in business, life and mentoring. A long-term mentor both with Futurpreneur Canada and the Regina Chamber of Commerce, Al Norman was surprised at first that he had been paired up with Jessica Williamson. With no previous retail experience, he wasn’t sure he would be able to provide Jessica with the help she needed to realize her dream of owning an active wear clothing store. But it turned out, what she needed was general business advice. And that was something Al could help with, through his experience as a consultant with the Paradigm Consulting Group. Saying he finds it rewarding to mentor entrepreneurs who want to learn, grow, and take responsibility, Al has great pride in the fact that his protégé has won several business awards in Saskatchewan, all stemming from what he calls Jessica’s “great business plan, realistic sales goals and passion for business.” With his history of mentoring future business leaders, Al hopes others follow his lead in providing support for entrepreneurs.